(hi-res) From Sudbury Historical Society 1986 book. 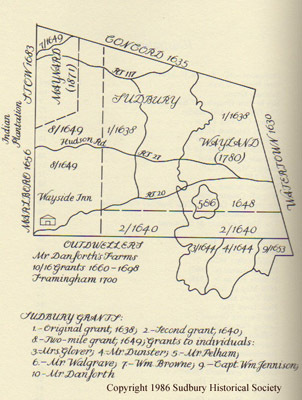 This map is made from the geometry found in the book A Brief History of the Towne of Sudbury in Massachusetts 1639 - 1939. See the image below. 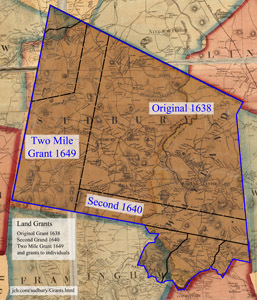 And it is layered on the 1856 Map of Middlesex County by Henry F. Walling. The blue line represents Sudbury at its maximum extent. There were 3 grants that formed the town and several to individuals. Hudson, Alfred S. History of Sudbury, Massachusetts 1638 - 1889. Town of Sudbury, 1889. Notes on grants are in Chapter IV. Page 57.